As part of my participation (though tardy) to The Canadian Food Experience Project Challenge Seven: A Christmas Tradition the following is my story. 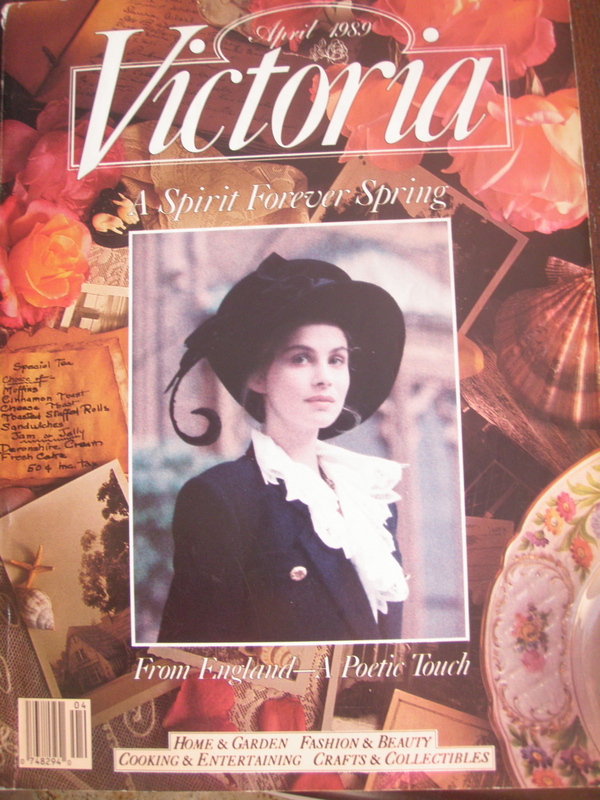 I have bought Victoria Magazine since April 1989. I was working in Westmount at the time and, during my lunch hour, I took a walk on Sherbrooke Street West and ended up in Cumberland’s Drug Store (now a PJC). Whilst browsing the magasine aisle, my eye was drawn to Victoria and I had to look inside. Oh, the beautiful photos, the recipes, the quotes: “Oh, to be in England Now that April’s here…”, Robert Browning. – I was totally hooked! So beautiful and so worth the three bucks! (It’s now $6.99). It was a bi-monthly magazine at the time. Oh! To have to wait a whole two months for the next one!!! I couldn’t stand it! It then became available monthly. Yea!!! It then changed ownership and they made it look just like another Martha Stewart-type of magazine (not that I don’t enjoy Martha, I just didn’t want Victoria to look like it). That did them in and they disappeared for a few years and then… Hark! An obvious fan of the original re-started it just like it was – bi-monthly (but I’ve faith….) Happy Days! The December 1991 issue had a recipe for a “Quick Fruit Cake”. Hmm… I was sceptical but it looked really nice and the ingredients did not contain any of that yucky fluorescent cherry crap so I decided to try it. It just so happened that my father’s new girlfriend was introduced to us on Christmas Eve. Poor thing, she was overwhelmed by Larry’s tall, exuberant daughters! Hmmm… let me taste that fruit cake. She must have eaten about half the plate! This year is the first Christmas without Dad and Susan was definitely invited to our early Christmas dinner on Sunday. Of course I had to make sure I had some to give her! The smile was worth what little effort was required. 3. Bring to a simmer over medium heat. Simmer for 5 minutes, stirring occasionally to prevent sticking. Cool 10 minutes. 4. Sift dry ingredients into a large bowl. Add cooled fruit mixture and eggs. Mix with wooden spoon until blended. Pour into pan. 5. Bake at 300 F for 1 1/2 hours until skewer inserted in centre comes out clean. 6. Cool in pan sent on rack 5 minutes. Remove from pan. Cool on rack. Cut a thin slice from top of cake to make cake even. Prick top of cake all over with skewer, then spoon brandy over cake. (Here’s where I differ. I prefer to spoon jam onto cut side which leaves the bottom nice and smooth. 2. If desired, heat 2 or 3 metal skewers until red hot. Press into marzipan to make a caramelised lattice pattern. Repeat until pattern is complete. You can watch the how to right here! 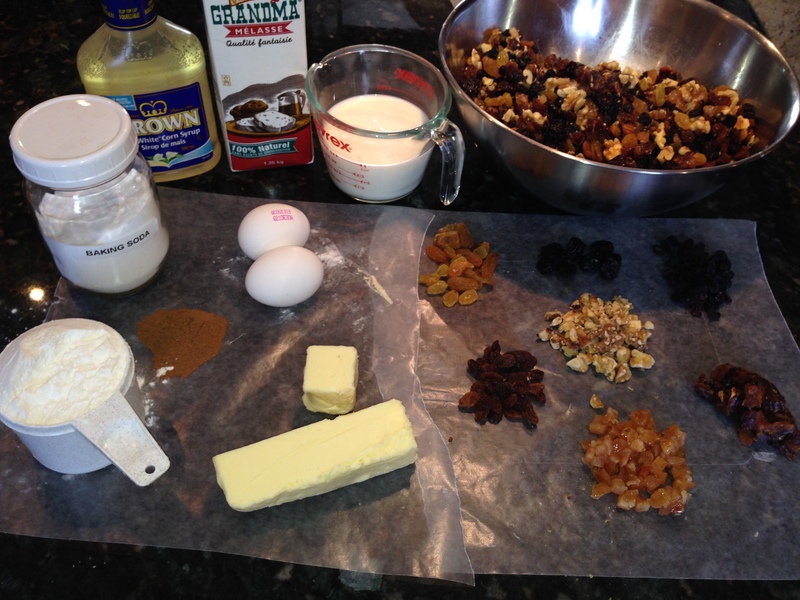 This entry was posted in cookies and cakes, Cooking Lessons and tagged Christmas, How to make fruit cake, Quick Fruit Cake, Victoria Magazine. Bookmark the permalink. Fluorescent green cherry thingies… I agree those are awful. Dates and brandy, sounds much better… Happy holidays. Cute video and interesting recipe. Like the fact that one of the ingredients is Molasses, but didn’t realize it was being packaged in cardboard containers now. Think I still have my glass container with some of Grandma’s Molasses still in it. Can you post the ingredients for this recipe as I didn’t capture it from the video? Hey there Mary, I’ve re-vamped my post! Hope you enjoy! Thanks, Dale for posting this recipe – I’ll try it. And, now that you mentioned Victoria magazine, I know I have one somewhere and it’s pretty old by now. But, like you I’m a fan of the original magazine, you know the classic issues when this magazine was first published. Happy Holidays! You are most welcome Mary! You’ll see, it’s really good. Oh, I just googled the mag to find out if I could get the back issues (it started in 1987) da-yum! $20 a pop! I may be crazy enough to get them… just love it! Ha ha! I knew I was not alone! Happy holidays to you and yours as well. That looks so moist and delicious. 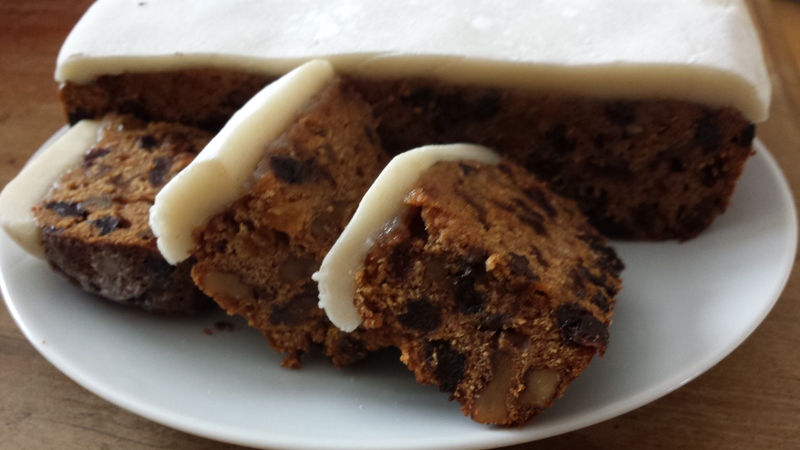 I used to make a quick fruit cake from a recipe given to me by a Welsh woman – a traditional one called ‘Barra Brith’. In Ireland, we have ‘Barm Brack’ which is basically the same and I used to serve it with Wensleydale cheese! Happy days. It is indeed pretty moist (for a fruit cake, that is). The marzipan topping really makes a difference too. I like the names of both the Welsh and the Irish one!